Happy first Hump Day of the new year! Sorry I've been a little MIA from the blog for the last few days, but I was having too much fun this past weekend, then recovering from it! I spent New Years Eve at my sister's lake house, and ended up at her neighbor's party to ring in the new year. I believe we all stayed up till 2am (a very late time when you have toddlers), then continued to party all weekend with the rest of my family in Killington, VT. There, we celebrated both the New Year and Chrismakkah, so it was a non-stop, yet extremely fun weekend. Lets just say I was dragging on Monday, which meant no blog post, but the time off was well worth it. Not only did I have an amazing weekend with my family, but I spent Monday organizing and writing down all of my goals and plans for 2016. I'm so excited for the new year, and have a feeling it's going to be a great one. I also can't wait to share with you all the things I have planned for Threads for Thomas in the year ahead! Winter arrived along with the new year, as the temperatures really dropped here in New England. We even got some snow, which means it's time for me to start throwing on the layers! The key to not looking bulky while layering is to use thin pieces for your base layer. Since silk is pretty warm, I started with my favorite silk Equipment blouse, then added my IRO long sleeve shirt, which feels more like a light weight sweater, and topped off my look with a thick cardigan. Wearing a hat is one of the best ways to keep warm, as you lose a lot of heat through your head, and I love how a beanie can make your outfit look cozy yet stylish. 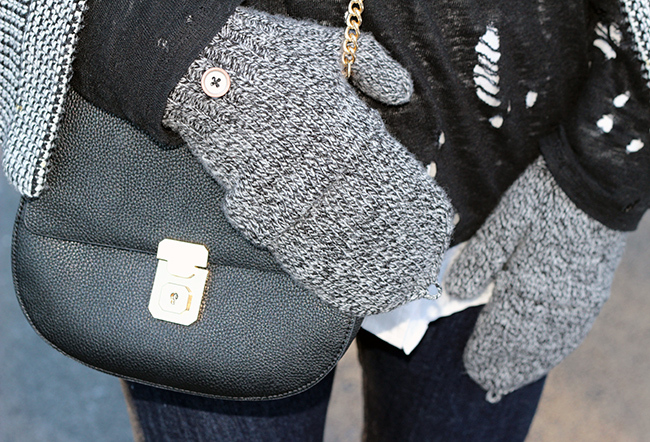 I finished my look with my convertible mittens, and love how they easily transform from mittens to fingerless gloves. This pair is from Madewell, which are no longer available, but I linked some great alternatives below. Have a great second half to your week and thank you for reading! So glad you had a fun holiday weekend! This outfit is so chic! You look gorgeous! Loving your winter look! The accessories & coat are super stylish even though it's cold! Love this look! Your jacket is adorable!! You could never go wrong with black and white! This look is simply amazing! Love the bag. Sounds like you had a ton of fun celebrating! I'm always tired after being off my routine. Love this outfit! You look great. So many good details! Love the layers, and you're pulling off that "jacket on the shoulders" look so well! Great tip - I've never thought about wearing thinner layers underneath to avoid bulkiness. I love the layers but what I'm really obsessing in is your sunglasses! Beautiful! Nice outfit dear, so stylish. You look fantastic in this cold day look. I love every piece of this outfit. Your layering looks so chic and so warm. It sounds like you had a great start to the New Year this weekend. I wish you a wonderful year! Sounds like your holidays were busy and wonderful! Love the layers in this outfit. They're so well done! Really cute look. I'm loving that cardigan. It's such a nice heavy knit and looks like it really keep it's shape due to design & construction. It makes for a good topper but I'm sure would look chic at work as an alternative to a suit jacket. I love it! What a great piece. (Jealous). You really are THE best at layering! I need to take a page out of your book, because you always look so chic and elegant! Glad you had a wonderful holiday! It sounds like the perfect holiday weekend! I love your winter layers! This is such a chic look! love how you layered! such a chic winter look! You look so fabulous!! Love everything about this look! Those gloves and hat are the cutest! Loooooooove your glasses! I need a pair. Nice style! This is seriously awesome. The layers go together perfectly. This layered look is so pretty together! Such a pretty cardi and I love those sunnies. And, it sounds like you had a blast on NYE and after with family and friends! Beautiful grey and black layered look Rachel! I can always count on visiting your blog for clean, polished outfit inspirations. Those sunnies are def trendy and chic! Love this outfit ♥ They tones work perfectly together! I love your outfit and your distressed sweater! Happy New Year! Love all the layers in this outfit! You look so chic! Very cute layers! I especially love the beanie and the glittens - so good for keeping warm and using your phone! What a great layer look for winter. Love those cute gloves. Thank you for being a part of TBT Fashion link up and hope to see you soon! Love this layered look. Lov ethe beanie, the sunnies and the jacket! Looks like you had the best New Year's Eve Rachel. Cheers for another fantastic 11 months!